Essence of Holy Quran ~ Islam My Ultimate Decision . I tried to choose a word or a small sentence that could encompass the essence of the Holy Quran - but then I got into lot of different meanings and points of view by different scholars and interpretors of this glorious Holy Book revealed onto mankind. Then I thought of listening to those non Muslims who read the Holy Quran voluntarily and then deciding to become Muslims. And I was amazed to find that a majority described the Holy Quran a divine revelation for those seeking the truth. One word so small but which encompasses in itself the entire message of the Allah Almighty. Truth is one thing that we always seek and when its meaning is unfolded by the Creator of the Holy Quran, we need not be afraid of going astray for the path leading to the ultimate truth can never be wrong, specially when every word of the Holy Quran remains unpolluted since it revelation more than 1400 years ago. And it is the word of Allah that is attracting many and many non Muslims to convert to Islam everyday all over the world. Many of these are Christians, who have read the Holy Bible since their childhood but even then when they see the mention of previous prophets and Holy Books mentioned in the Holy Quran, they get attracted to read the Holy Quran and by and by become a stage comes when the words of Quran are drilled into their hearts and finally they convert to Islam. Even non Muslim women, who otherwise find hijab or the essential covering of their bodies as a mean of oppression, when converted to Islam readily and happily wear hijab and even defend their decision for it Islam enlightens their heart and then wordily appearance becomes a secondary thing. I finished studying early and was left to ponder what to do next. 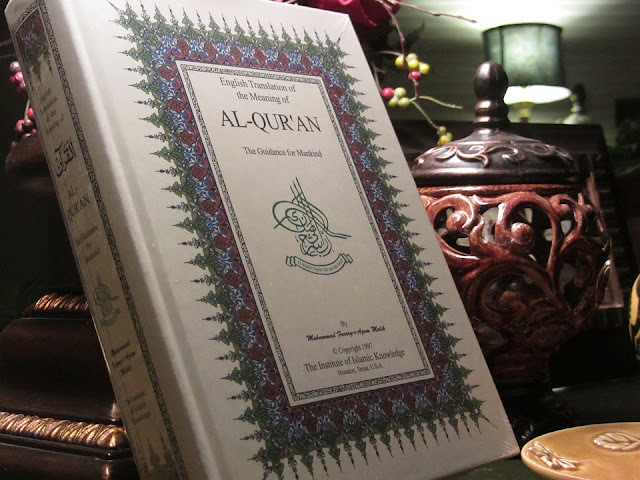 Then I saw the Quran sitting on my bookshelf, and I said to myself “Why not, what could it hurt”. So I picked up the Quran and started to read. Never in my life have I heard a truer speech than the Quran. What a bold statement! I said to myself, “Either this book is a lie or it is the Truth”. But as I read, it became very clear to me that there is no falsehood in it. I was not able to put it down, I read and read through the whole night. I was shocked and amazed, I said to myself: “This is simply the Truth”. The more I read it, the more I wanted to read more and then one day I ended up converting to Islam. May Allah reward (better than the worldly life and all that is in it) all the brothers who helped me find the Truth, and guide them to the straight path, Amen. So read translation of Holy Quran in your language without any prejudices and without making up your mind to converting to Islam. and if you are God fearing and are in pursuit of truth, the truth will be unveiled to you for Holy Quran contains guidance to seek the truth and those truth seekers ultimately find it in the folds of its pages.